The favorite elbow sleeve of several multi-time SuperBowl athletes, the PRO 475 SuperBowl Sleeve features a nylon lining for ease of application. 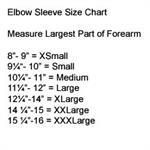 A contoured body design assures a snug fit while also providing extra protection to the forearm. The outer neoprene skin adheres to the ball for extra grip making this a favorite of running backs and receivers. Available in black N1 material only with bare neoprene outside.